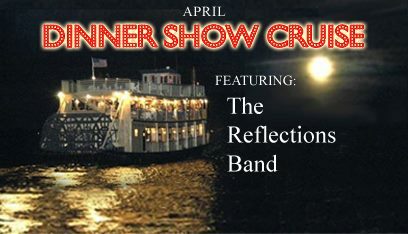 This three hour DINNER SHOW CRUISE features 'The Reflections Band'. As you cruise along the Indian River prepare to be dazzled and captivated as they play SOUL, FUSION, FUNK, LIGHT ROCK, HIP-HOP and modern R & B. You will also enjoy the "Queen's" delicious Dinner Buffet , amazing sunsets and beautiful river views . Boarding begins at 6:30 pm from the Cocoa Village Marina located at 90 Delannoy Ave, Cocoa, Florida 32922. The Queen will be underway from 7:00pm-9:15pm. MAIN COURSE House Salad and cucumber/tomato platter Fish of the day (Mahi or Salmon). Boneless Beef Ribs braised with Peppers, Onions & Burgundy Wine Sauce. Roasted Red Potatoes & Fresh Sauteed Vegetables, Garlic Rolls & Herb Butter. DESSERT Chocolate Cake and The Tulip's famous Bread Pudding & Cream Sauce. BEVERAGES Coffee, Tea & Water will be provided. Captain's Top Shelf Cash Bar will be open in the Queen's Room & 2nd deck (credit cards accepted).